I’m an unabashed Trekkie. I grew up on Star Trek: The Next Generation, watching it at my piano teacher’s house between lessons. I watched Deep Space Nine and Voyagerreligiously when I was home from college. I crushed on the usual suspects — Wesley Crusher, Tom Paris, Harry Kim, and Julian Bashir — and consumed my fair share ofStar Trek paperback novels in the lull between new episodes. I saw every TNG full-length movie at midnight openings in theatres. I own the Star Trek Encyclopedia and even made a point to visit the Las Vegas Star Trek Experience exhibit, when it was still touring. 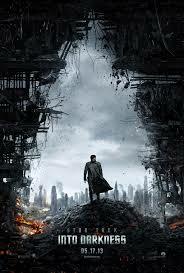 And, I loved Star Trek Into Darkness (which is being released on DVD and Blu-ray this week). This didn’t seem particularly unusual to me until I read last month that thousands of Trek fans at the official convention in Vegas had voted Into Darkness the single worst Star Trek film in canon history. They voted it worst behind Star Trek III: The Search for Spock. Behind Star Trek: Generations! Behind Star Trek: Insurrection! Behind Star Trek V: I Found God at the Edge of the Freakin’ Universe!! !